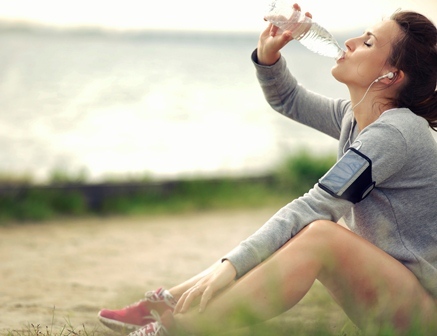 Keeping hydrated is an accepted part of being healthy for many of us, but recent research suggests that drinking excessive amounts of fluid when exercising might not be so beneficial for our health. Professor Emergency Medicine Ian Rogers from St John of God Murdoch Hospital says the message to ‘drink, drink, drink’ is a relatively new one and just a generation ago, people only drank when they were thirsty. “We now see everyone carrying water bottles and sports drinks to meet their assumed fluid quota for the day,” Professor Rogers says. For athletes, keeping hydrated is seen as a critical component of performance ability, but when water, sports drinks and other hypotonic fluids are consumed excessively, the kidneys are unable to excrete the excess fluid. This lowers the sodium level which is needed for the organs, particularly the brain, to function properly. This condition is known as Exercise-Associated Hyponatremia (EAH) and its symptoms include headaches, vomiting and altered mental status such as confusion. In extreme cases, it can lead to seizures and even death. Although globally rates of EAH are low, it has been reported across a large cross-section of sports and activities. Athletes who have suffered with varying degrees of EAH include triathletes, soldiers, marathon runners, footballers, hikers, rowers, kayakers and Bikram (hot) yoga participants. Professor Rogers is one of an international panel of experts whose aim is to eliminate deaths associated with EAH. “These deaths, although rare, can be avoided with education about the dangers of drinking excessively,” Professor Rogers says. Hew-Butler et al, Statement of the Third International Exercise-Associated Hyponatremia Consensus Development Conference, Carlsbad, California, 2015 Clinical Journal of Sports Medicine, 2015; 25: 303–320.